So picture this. You are a business owner who has just launched your new company. You’ve got your logo.You’ve got your marketing plan, and now you need to find a web designer for hire to create your cool new website. You’re feeling pretty smug. Woop woop! But hold on there! Where do you look? How many designers should you speak to? How much should you spend? Fear not! I shall guide you through a simple checklist and answer all of your questions below. This may sound stupid, but before you jump in head first and start trying to find a web designer for hire, ask yourself; why do you need a website? If you plan to write a bit of content, throw up a few images then launch your site and do nothing. You may need to rethink your strategy. A website, if used correctly, can be an amazing thing. So don’t spend the time building a site that won’t return your investment. Be prepared to add content regularly. If you don’t have the time, pay someone to do it for you. Search engines love new content. So be clear on how you intend to use it and why you need one. Websites are a serious business investment. So do it once and do it right. Step 2 – What type of site do you need? In most cases this will be straight forward. This could be an e-commerce store for your products. Or a business site that provides information about your company and it’s services. Whichever type it is, try and have some idea of what you want the site to do. Think about the site structure and what pages you would like to include. So for example list your pages: Home, About, Services, Blog, Contact etc. And include any additional functionality that will make your website easy to use. For example: an email signup form or appointments calendar. Lastly, decide if you are going to want to add content and update the website yourself. If you do then you’ll want to mention this to the web designer or web developer that you hire. They may provide you with a few different options such as WordPress, Wix or Squarespace which all have their own content management systems. All of the above will allow you to login to your site. You can control the content and functionality without the need to call your web developer every day. Awesome yeh? This is important as this will determine which web designer for hire you choose to work with. So put a few figures on paper. And be realistic with your costs. Remember this is a business investment and it deserves a decent budget. Some designers may even advertise their prices on their website. And this will provide you with a rough cost of what you will need to spend. So how much does a website cost? For example £1000 ($1200) or more should get you a basic well optimised, good design for your business. If you have a budget of less than £1000 to spend, then you will most certainly get a very basic site that at best will look amateurish. So save your money! If necessary hold off launching your site until you have the budget to hire that perfect web developer. Every project needs a plan. So when you look for a web designer to hire, this will be no different. As in step 2, be clear about what you want. The more information you can provide at this stage, the less gaps it will leave in the process. Any designer will be impressed with this level of thought and information, so try and be thorough. Before you go crazy looking on the web, I’d suggest you first ask your friends and people in your network. This is a great way to find someone who has been personally recommended. So it takes away any concerns you may have about the designer’s ability. When you do go to your search engine of choice, typing the words “web designer near me” should bring up a host of potential candidates. Firstly, I’d suggest picking the ones that have reviews. These guys have obviously got experience and feedback from previous clients. So they are definitely worth checking out. You can then look at some of the other designers on the first couple of pages as well. Other than doing a general web search, you can also visit online directory sites such as Yell, FreeIndex and Yelp. These will bring up a long list of candidates for you to choose from also. When you start to look at potential people to work with, check on the quality of their work. Do they have a good selection of designs? Does their work match your expectations? Have they worked in your sector or niche before? Check they have in-depth case studies with explanations of their work. This should provide evidence that they have created the sites and can explain their work process. A web designer who just posts pictures may lack any true understanding of what is required. Look at their About Me section. You want to look to see how much experience they have. As long as they have at least 3-4 years, they should be good candidate. And less experienced designer may provide you with a competitive price, but at what cost? How does their own website look and perform? Good? Bad? If the designer’s own site looks bad then it is an indication that they may not be the right person for the job. And don’t be put off if the site design and examples look expensive. It’s always worth contacting the designer or developer in question. They may be able to match your budget and provide you with a payment plan to help spread the cost. At this stage you may have a list of a 5-6 candidates. But realistically that is too many. So you’ll need to narrow this down to your top 3-4. I’d suggest you choose the ones that look like they can create a site in the style you want. So don’t hire a web designer who specialises in fashion sites if you want to create a website about fishing. The size of your budget may also dictate which designer you end up working with. Some will advertise their prices so this makes it easier for you to make a decision. If you have a small budget, you may want to steer clear of any web developer who looks like they work with large companies. They are more likely going to command a higher fee. Ultimately if you love their work and vibe then they could be a good fit for you. Now that you have your top 3 web designers, it’s time to make contact with them. If you feel brave then give them a call. Speaking direct is often the best way to discuss a project. Failing that, sending an email is perfect. Using Step 4’s information I’d suggest you provide and overview of what your business does and what you want. Keep it fairly generic at this stage so the designer can quickly identify if they can help and if they are interested in working with you. Because websites are all different and often very complex, the designer may not want to provide a price at this stage. However some may be able to provide you with a price range or a list of their web design packages. If you can, I’d suggest you provide your budget range. This will be a big help in the decision process. But if they decline, don’t be offended. It could be that they are very busy or just feel your project isn’t a good fit for their skills. Need your website by a certain date? Now is the time to mention it. This will almost certainly control whether he or she can help you or not. NOTE: Quick turn-arounds will cost more due to the designer having to drop other projects to complete yours. Assuming the conversation goes well, you can then suggest that you send over your full brief with more details. However, the web designer or developer may have a form of their own for you to fill in. This may be an attachment or an online form. Thank the person for their time and let me know you are looking forward to receiving their proposal. By this stage, you should have a better idea of how to select a web designer for hire. When you receive your proposal it should be a document of around 6-12 pages of information. I’d recommend spending a few days looking over the details and absorbing the information. If you are unclear about anything, just send an email asking any relevant questions. Once you have decided on which designer or developer to hire, it is polite to send an email to the candidates who you didn’t choose. Thank them for their time and wish them well. It costs nothing to be nice and who knows, if things don’t work out, you may need to contact them again. Now you can contact your chosen designer and organise a formal contract. The designer should be able to provide a document outlining their terms and conditions. You may wish to provide your own as well. But this often isn’t necessary unless you have an NDA. And I must mention that you can typically expect to pay 50% of the total fee upfront. This goes towards the initial design time and plugin purchases that the web developer will incur. So make sure you have this available. In some cases the designer may allow you to pay in instalments. So it’s always worth asking. Once you have paid your deposit and signed the contract, the web designer should be able to proceed with your website project. The designer should then provide you with an approximate schedule so you know what the time frame is. You will need to collate all your content and material to hand over so the designer can start work. Page ideas and written content. Logins to: WordPress, hosting (if you are providing), control panel, FTP, domain, email, social media, Google Analytics, etc. Original web design link or files (for rebranding jobs). Logo in .png or .svg format. About page content with team bios and high-resolution photos (400-600 words). Service page content (600-800 words). Contact page, contact form notes and required fields. You should at some point have access to the web developer’s staging site where your website is being built. Here you’ll be able to provide feedback and help shape the design and functionality of your site. Once the website has been built, checked and signed off, you’ll need to provide the final payment to the designer. They will then migrate your site over to the live host server for launch. This is where your website lives. This may be your own preferred web host or it may be one suggested/controlled by the web designer. Make sure you clarify this part early on in the relationship. Once uploaded, you will see your website live via its website url. NOTE: It will take a some months before your website becomes fully searchable in search engines, so don’t expect to be on page one in a few days. Until you have built up some regular web traffic, backlinks and authority, you will not be ranked for some time. You may want to consider asking the web developer for some help here. Or consider employing an SEO expert who will have knowledge of how to do this for you. 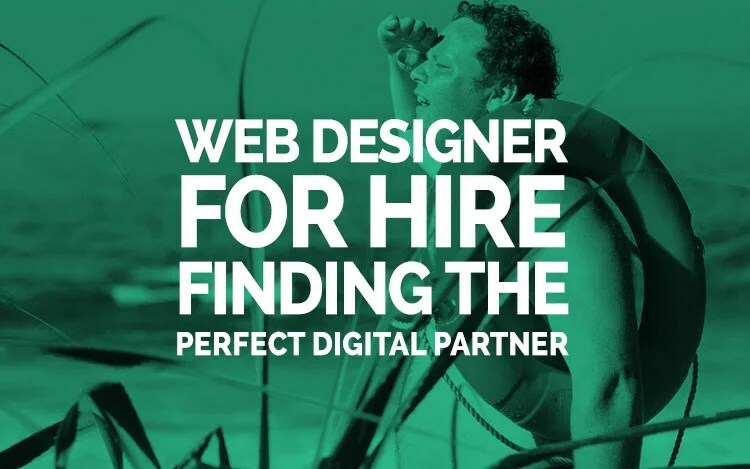 If you enjoyed reading this article on Web Designer For Hire – How To Find & Choose One please comment/share.